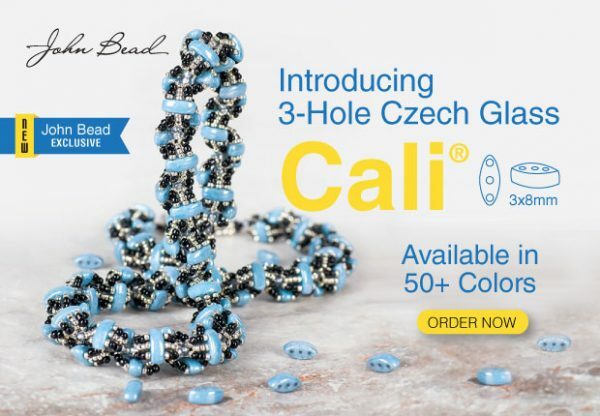 Cali is a 3-hole bead made of Czech glass measuring 3×8 mm. It is available in over 50 colors and special effects. 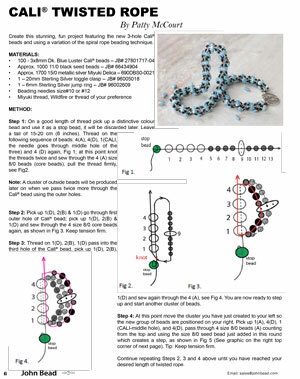 This new bead will showcase seed beads spectacularly, which are the staple of designer pieces that illustrate bead-weaving techniques. Cali is curved on both sides boasting a double convex surface, which gives the consumer the ability to use it as a spacer or as structural pillar. The creative beader will construct complex shapes, making the possibilities endless. If you love the necklace featured in our advertisement as much as we do you’ll be pleased to learn we have it available as a step by step. Author Carmi CimicataPosted on January 23, 2017 January 23, 2017 Categories Bead, Cali BeadTags Beads - CaliLeave a comment on Introducing The Cali Bead!